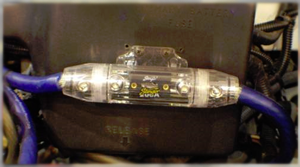 Stinger Fuse Holders help protect your system and car by stopping shorts, and surges before they get to your amplifier. Without a fuse to stop shorts your wire can light on fire, and in turn like your car on fire. A fuse holder between your battery and amplifier will stop this from happening. Keep as little wire as you can between the fuse holder and battery. This will help protect your system as this wire remains unprotected.